I am always on the lookout for a delicious and healthy salad to compliment my holiday meals. I want it to be healthy but not filled with a ton of ingredients, just simple, healthy and tasty. And this recipe hits the nail on the head perfectly! 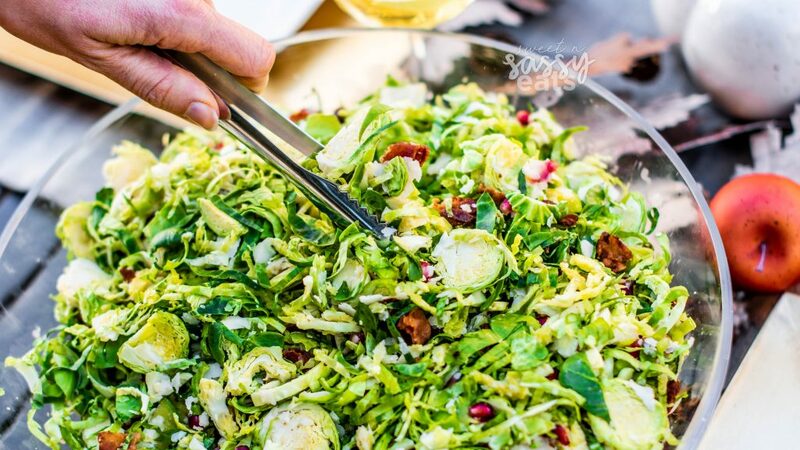 I love shaved brussel sprout for these types of salads because they pack such a high nutritional punch because they are high in fiber, vitamins, and minerals. Brussels sprouts are especially rich in vitamin K, which is necessary for blood clotting and bone health. Brussels sprouts contain kaempferol, an antioxidant that may reduce cancer growth, decrease inflammation and promote heart health. This salad (besides being super healthy for you) is also very versatile, you can remove or add ingredients to your liking, so be creative! 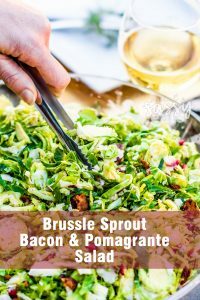 It also is super easy to throw together and because the Brussel sprouts are so hardy, you can even assemble this salad ahead of time (like 24 hrs before serving) and even pour the dressing on and the salad stays fresh and crispy! So this makes your holiday cooking prep even easier! I think Brussel Sprout have gotten a bad wrap in their past, but they have easily become one of my favorite vegetables cooked or raw! 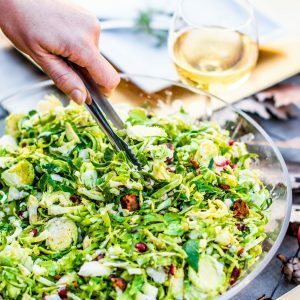 I hope, even if you are a Brussel Sprout hater, that you will try my many Brussel Sprout recipes and give these nutritional powerhouses a chance! This light salad is a nutritious and light side dish perfect for any meal but especially for a holiday dinner side dish. Thinly slice the Brussel sprouts, or use a mandoline to thinly slice. You want a thin slaw-like texture; place in a bowl. Add Parmesan Cheese, crumbled bacon & pomegranate seeds to bowl. In separate bowl mix lemon juice, orange juice, olive oil, honey; mix well then add salt & pepper to taste. Pour dressing over salad and toss. Refrigerate until ready to serve. Should last well in the fridge for 1-2 days.